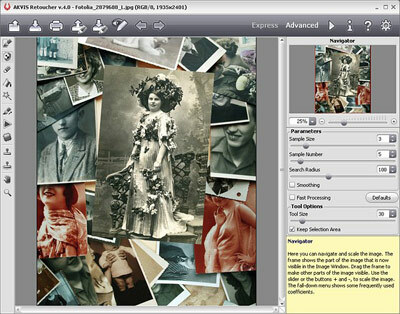 AKVIS Retoucher is an efficient software for photo restoration and photo retouching. Retoucher does not only remove dust, scratches, stains and other defects but is also able to reconstruct the lacking parts of the photo using the information of the surrounding areas. The work is done automatically; you only have to indicate areas to be restored, push the button, and here you are - the surface becomes smooth and imperfections disappear. ...... It looks like magic when you observe the scratches vanishing before your very eyes. AKVIS Retoucher is also a handy tool for improving photo composition. It is possible to remove date stamps, small irrelevant details (wires, refuse bins, etc) and even bigger objects (i.e. people who fell into the shot by accident, cars in the background). If you need to increase the canvas size (from one side or proportionally) to bring the main object into focus, i.e. to center it, AKVIS Retoucher will help you to extend image patterns to the blank areas of the canvas. Polygraphists will find Retoucher useful in doing the prepress processing job. They often have the problem of extending the borders of a layout that does not have space for cropping. AKVIS Retoucher saves much time by doing this quickly and efficiently. AKVIS Chameleon - Collage Creation Software for automatic adjustment of objects. Resize images without loss in quality. AKVIS LightShop lets you create an infinite number of amazing light effects. Qweas is providing links to AKVIS Retoucher 5.0 as a courtesy, and makes no representations regarding AKVIS Retoucher or any other applications or any information related thereto. Any questions, complaints or claims regarding this application AKVIS Retoucher 5.0 must be directed to the appropriate software vendor. You may click the publisher link of AKVIS Retoucher on the top of this page to get more details about the vendor.